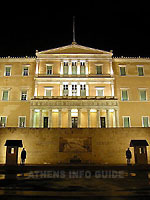 Every Sunday at 11:00, tourists gather in front of the Parliament building on Syntagma Square (Plateia Syntagmatos) to watch the ceremonial changing of the guard in front of the Tomb of the Unknown Soldier. 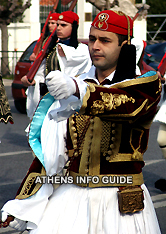 The guards (Evzones) wear their traditional white kilts, red and black caps and red clogs with pompoms only that day or on special occasions. 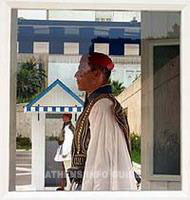 On every other day, the Evzones wear regular khaki uniforms with skirts and the changing of the guard takes place every hour on the hour, 24 hours a day. The guards are tall and well-trained soldiers. They belong to the "Proedriki Froura", the guards of the President of Democracy. It is a high honor for every Greek soldier to be chosen as an Evzone. Mansion and the gates of the Presidential Guard training camp. • accompanying the President of the Republic on official foreign visits . • offering honors and welcoming foreign officials on visit . The uniform is a traditional representation of Greece's historic mountain guerrillas, the Klephts (thieves) and armatoles (bandits), which resisted the Turkish occupation and fought hard in the War of Independence. The skirt/kilt is called a 'fustanella' in Greek. There are 400 pleats in it; one for each year of the Turkish occupation. The Evzones have professional steam irons in the barracks and they have to iron them themselves. The uniforms are made by special craftsman in workshops within the barracks and take 80 days to make. 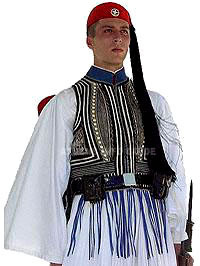 Officers wear an older more elaborate form of the uniform and since the Second World War, Evzones from Crete wear blue breeches and caps with white boots. • the garters, black for the Evzones and blue for the officers. 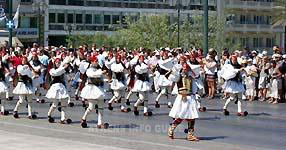 • the "tsarouchia", the traditional shoes of the Evzones. 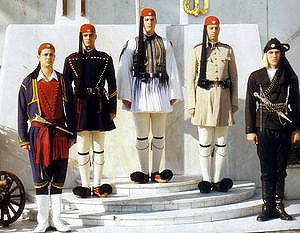 The outfit’s variations include (from left to right) the ‘Cretan uniform’, an adaptation of traditional Cretan garments representing all Greek islands, the Macedonian blue woollen winter uniform, the cotton summer uniform which is the official version reserved for special ceremonies, the modernized mainland uniform as well as and the traditional uniform of Pontos. Throughout their entire service, each Evzone teams up with a partner. Between them they share both training and duties. Mutual help is also appreciated when donning the uniforms, a task that can prove time-consuming. Slipping into the official uniform, for instance, may take up to half an hour. Help also comes in handy with smoothing the black tassel atop the Evzones red cap, or ‘fessi’, straightening the collar or tying properly the two-part fustanella, the traditional 400-fold kilt. Through the hottest summer and the coldest winter, the Evzones invariably wear white woollen stockings and a leather belt with bullet holders to emphasize the waist of the ‘well-belted’ soldier. The sculpture on the Tomb the Evzones guard, shows a Greek soldier while the inscriptions scattered around the tomb quote fragments from Perikles' Funeral Oration of 430 BC, delivered after the first year of the Peloponnesian war to honor the fallen Athenians as well as the names of places where the Greeks have fought in different wars. It was designed by architect Emmanuel Lazaridis. In April 1929 work began and the monument was completed in March 1932. It was inaugurated on the National Holiday of the same year.